I am a Biotech post graduate, extremely athletic and competitive, and feel special by the love and affection of my family. I was born in Gandhidham (Kutch) Gujarat and was brought up in a family where value for hard work and discipline holds more importance than the money and financial status. I have a younger brother studying in 11th grade, and he looks up to me for every little knot in his mind. What are the awards and titles you have earned? 1. IIT-Bombay: First Prize in Ideovative-2011: Presentation of Entrepreneur Business Idea for industrial production, marketing and trading of Algal Biofuels. 2. Working Model: Protein Based Biosensor to determine the content of albumin in blood samples. How was your journey from childhood to youth? I was brought up in the twin city of Gandhidham-Adipur. My teenage years revolved around performing well in Chess, Basketball and Swimming. So, I have been to more than 5 cities for being a part of inter-state competitions. At the tender age of 13 years, I was already a part of a lot of medical relief camps and blood donation camps during the year of 2001 when an earthquake struck our region. I have seen my mother working hard towards her personal career and also devoting equal time to her passion of writing poems. These tiny little things matter a lot in the growing up phase. I have been brought up with the conviction to earn well, but not at the cost of passion and self-respect. Do what you love and success will follow you, no matter what and where you are. Did you always think of being in the medical field? Or, do you think destiny played its role? I always wished to become a medical practitioner just like my father, uncle and my grandfather. A few marks here and there made me take up Biotech as a career to study. I am a post graduate with a lot of other certificates and diplomas to show in my curriculum vitae. And, it has been these courses and the time spent in a metro city like Bombay that have helped me grow up as an individual. I know how to talk to a beggar and a baker. I believe that being street-smart plays a more important role than being silent and studious. I know how to deal with everyday situations, and all of my confidence, I owe it to my personal choices. Never take your studies for granted but do not get so involved in your books that you forget to thank the authors who wrote them. Be grateful, be curious; there's no other way you can deal with the world around you. What motivated you to think in this area and succeed in this field? While studying bio-diesel generation at CSMCRI Bhavnagar, I got a chance to present a hypothetical business concept at IIT-Bombay at a national level. I worked around with the idea of presenting a 70 crore company with the breakeven points and USPs with two of my friends as my team-mates. We won the competition. This is when I got motivated to become an entrepreneur and take up business development and marketing as my self-learning module. Working for thyself is the most satisfying objective. It makes you fearless. No worry bothers you more than your own work. It makes you become multi-talented and self-disciplined. After all, that is what you are supposed to learn in school and colleges. Put your learning at work, and you will forever proceed ahead. Who has been your inspiration/mentor? I have been inspired by people within my family and friends circle. My grand-uncle is a revolutionary freedom fighter. My grandfather was conferred with the status of medical doctor when he came to Rajasthan from Sindh. My father is a self-made man who dared to be different and start up his career in a new and absolutely unknown place. My mother is the most hardworking lady I have ever come across. She works for her happiness, writes for her passion and has helped us grow into what we are today. I owe my confidence to her. What was the most challenging situation that you are proud of having faced and overcome? Our venture was a part of an Indo-German Green Festival in Pune. That was the first time for me to co-ordinate the events of the expo. I was taking care of transportation, setting up the stall, fixing the vertical garden in the stall and also being presentable to the crowd coming over. I had mud in my hands, sweat on my face and I was constantly on call to co-ordinate with my team. That was the last time I felt challenged. It made me learn a lesson. Challenge is what you face for the first time, unprepared and naive, thereafter you know how to handle a situation, and so, it isn't a challenge anymore. What do you think played a prominent role in achieving this position? 3. Steve Jobs, a biography. It is said that a woman faces more challenges than a man. What do you think about this? We hear people talk about equality, we read articles that speak of our rights, but it's only when you step in to the actual world will you realise that everything said and done is not just for the sake of it. Step in to the environment outside and you will feel confident and empowered. Reading about everyday challenges faced by women doesn't solve the purpose. Experience the challenge, fight it and feel the victory swinging right through you face. I have seen men feeling happy when a lady accomplishes their task. They have no hard-feelings but just sheer respect. The look in their eyes is unmatchable. Currently, I am handling the western zone for a horticulture company. I am looking forward to learn innovation and leadership skills at a short term course in IIT, Delhi in association with Stanford University. Being a freelancer at heart and mind, I am also working with a website interface and product designing company. Personally, I, sometimes, feel burdened by the fact that my younger brother, who is studying in 11th grade constantly looks up to me and I shouldn't be failing him. His gleaming face is my reward for my everyday living. What do you feel about your workplace? I work from home. It helps me save rentals and commutation time. 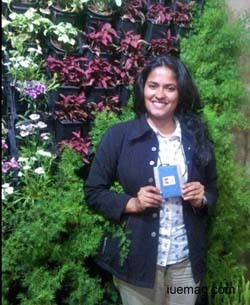 My workplace is the sites that I visit to develop lawns, vertical gardens and terrace gardens. They are barren & uninteresting. One look at the place gives me an idea about how beautiful it can become upon re-creation. We make greener spaces. We call it NATURAL URBANIZATION. We envision every corporate office and household to have a vertical garden in their premises. It is a self-cleansing module of plants fitted in wall-mounted frames. They need to be watered once daily and serve the purpose of having a green place in space constraint metro cities. Being a youth, what are the things you would want to change in the society or in our nation? Our educational system and lifestyle will never let us earn a house and money too soon. I wish to change this system. I want the youth to feel responsible towards themselves and their society. Do your bit, once in a while. You are bound to get returns. Take interest in politics. Have fun, make merry but not at the cost of your livelihood. Alcohol, smoke, roadies, betting are short-lived happiness. Plant a sapling, see it grow into a tree and when it is standing tall above you, think of the day you planted it years ago. You did your bit then, and now it cleanses the air. Stop throwing garbage in public spaces. Having a little piece of paper in your hand until you find a dustbin isn't a big burden. And if you can't find a bin, place one. Do your bit. Please impart an inspirational message for the youth. * No challenge is too big until you feel so. And once you have faced it, it won't be a challenge anymore. * Addictions are short-lived, invest in planting a seed, be it of an idea in your mind or of a fruit in your yard, it will give you happiness for a lifetime. * Make your presence felt, make a mark in your territory, put a ding in the universe. * Have expensive tastes, spend money on luxuries, only then you can earn more money. Being a cringe saver won't help you get rich. Thank you very much Ms. Satyenmitra, for taking out time to inspire our 'IU e-magazine' readers. I congratulate you on success gained till today, and wish you best for upcoming challenges and victories. Any facts, figures or references stated here are made by the author & don't reflect the endorsement of iU at all times unless otherwise drafted by official staff at iU. This article was first published here on 22nd July 2014.